As far as fast food salads go, Wendy's offerings are definitely as good as it gets. In fact, the salad options at other fast food chains are rather abysmal in comparison. Wendy's always has an evolving cast of salad options featuring thoughtful and often seasonal ingredients which really set itself apart in the category. 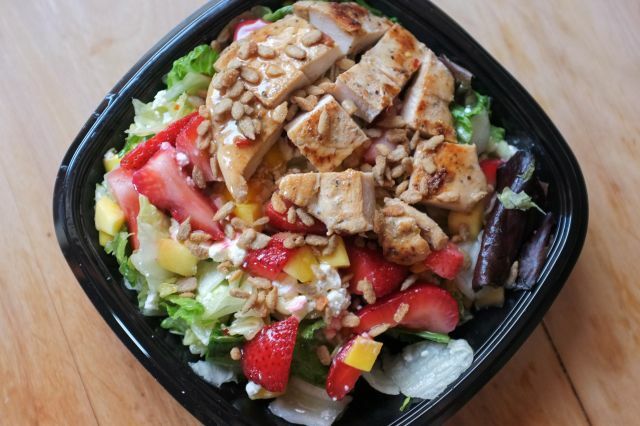 My favorite all-time fast-food salad remains the Berry Almond Chicken Salad that Wendy's first introduced as a seasonal menu item in the summer of 2011 and brought back the first few subsequent summers, much to my delight. Since then, they've more or less introduced some iteration of a berry salad each summer, but none have ever been as good at the original in my opinion. Whether or not berries belong in a green salad is a deeply polarizing topic. Personally, I'm a fan, but the combination can definitely be a bit off-putting when not done right. 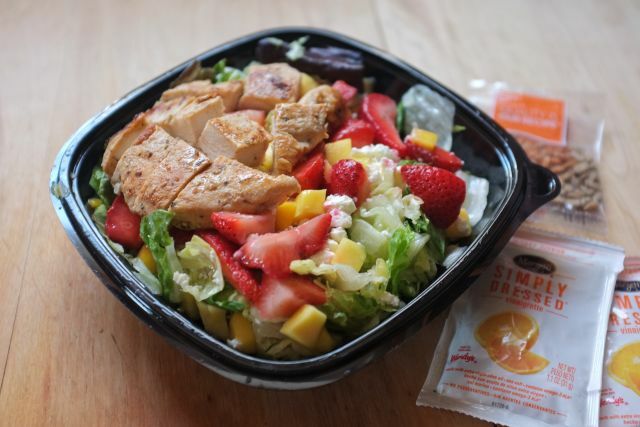 Which brings me to Wendy's latest salad offering: the Strawberry Mango Chicken Salad. A full-sized salad (which I actually split into two small meals) goes for $6.99 but I received this courtesy of Wendy's. The salad comes in a plastic box filled with various lettuces and leafy greens, "warm" grilled chicken (it actually was served warm which makes the salad seem freshly prepared), chopped mangoes and strawberries, and feta cheese. 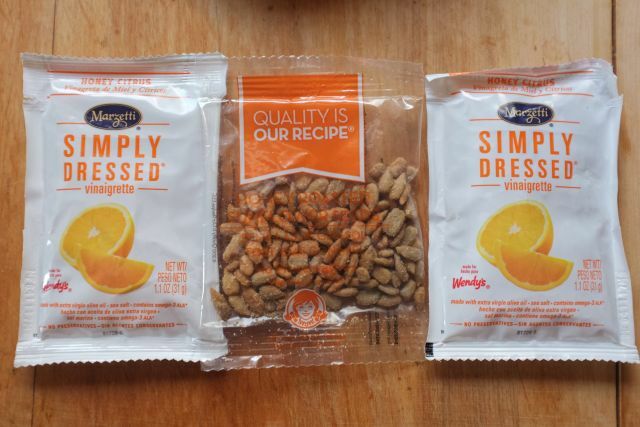 Accompanying it were two packets of Marzetti honey citrus vinaigrette (I only used one for the whole salad and it was just the right amount) and one packet of honey-roasted sunflower seeds. The overall taste of the salad is very light and refreshing, although a bit too tangy for my taste buds. The chopped mango and the honey citrus vinaigrette paired well together, but the flavors were a little too citrusy and tart. The strawberries were a bit bland in comparison and I almost found myself trying to pick around them. The feta had a very mild flavor where I think I would've preferred a stronger-tasting cheese to offset the citrus notes. The sunflower seeds added a little bit of texture here and there but were largely overwhelmed and lost among the salad's other components. The greens and chicken were both solid, but standard to most of their salads. 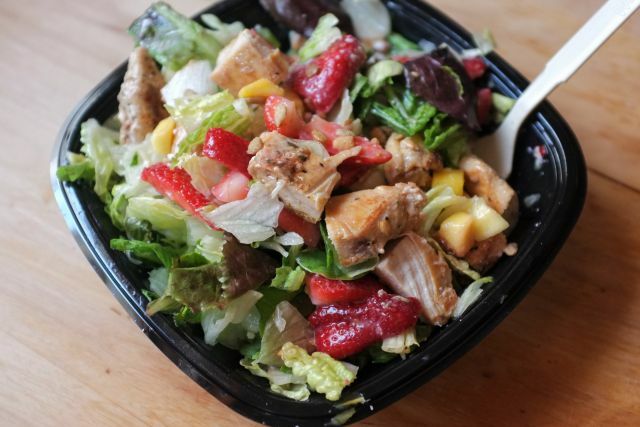 When it comes down to it, I was a bit underwhelmed by the Strawberry Mango Chicken Salad although I would likely still choose it over a salad from any other fast food chain. It's a refreshing choice for a light summer meal, but I'm still missing the Berry Almond Salad from years past. By Tania of Fresh Fizzle.